I'ts official. We have just signed a lease on the 5,000 sq.ft. , top floor, of the Saskatoon historical landmark: The Avenue Building. The space we have chosen could not possibly get any sweeter. 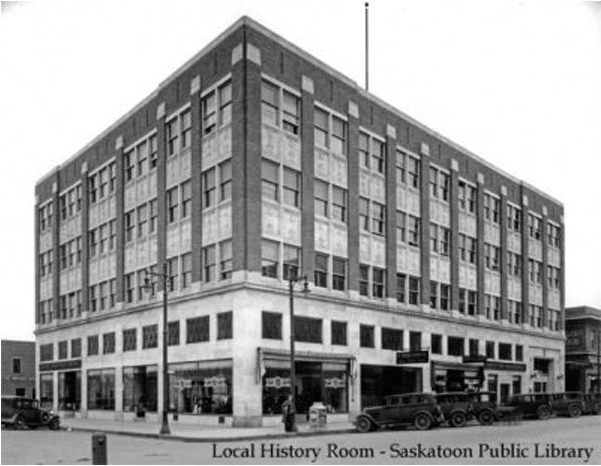 The Avenue Building is located at the heart of downtown Saskatoon (corner of 3rd Ave. S and 21 Street E) and it has quite a history. Originally known as the MacMillan Department Store, the structure on the south-east corner of the intersection was built in 1912 by Saskatoon’s future mayor, Frank R. MacMillan. In 1927, the T. Eaton Company purchased the business, but not the building, as it was ready to open its own store directly across the street. MacMillan’s store was the single largest department store in the city at that time. After selling the business to Eaton’s, MacMillan extensively remodeled his building, inside and out, to convert it to office space, and renamed it the Avenue Building. It featured expansive atriums with elaborate tilework, some of which exists today. It is now home to a variety of businesses and organizations. It even became a movie set, portraying a police station, in the movie "Murder Seen". In above picture from 1931 (saskatoonlibrary.ca): The Avenue Building, built in 1913, is seen at the corner of 3rd Avenue South and 21st Street East (across from Army and Navy). Also visible in the image are Avenue Coat and Dress Shop, N.Bawlf Grain Co., Saskatoon Novelties, Bank of Montreal, and Fingard Bowladrome. Autos are seen angle parked on the street and a man is also seen in front leaning on a light post. Very cool! That's a beautiful building! Congratulations. That space is awesome. The Avenue Building was built in 1912 in the Art Nouveau style. The building was originally home to MacMillan’s Department Store, which opened on October 1, 1913. The Star Phoenix estimated that 10,000 people crowded in the store during the grand opening celebration. At the time Saskatoon’s population was only 30,000 people. Original interior features include unique mosaic tiling on the 3rd and 4th floors as well as the original freight elevator and an exposed glass brick sidewall. The hardwood floors in the basement were originally built for a dance hall over top of 600 old tires reinforced with horsehair. Several movies and videos have been shot in the building over the years. What a great new location. I adore the Avenue Building. It might be my favourite office space in all of Saskatoon. Congrats, and good luck with the move. Thanks Jeff. We are moving in very soon. You should stop by for a beer once we are settled in.